The Walnut floor plan is one of Fountaingate Gardens’ most sought-after apartment homes. With only seven of these floor plans available, they are bound to be claimed quickly! Two spacious bedrooms, two full bathrooms and a den make The Walnut an excellent choice for someone who likes room for themselves, plus plenty of room for visitors or family guests. 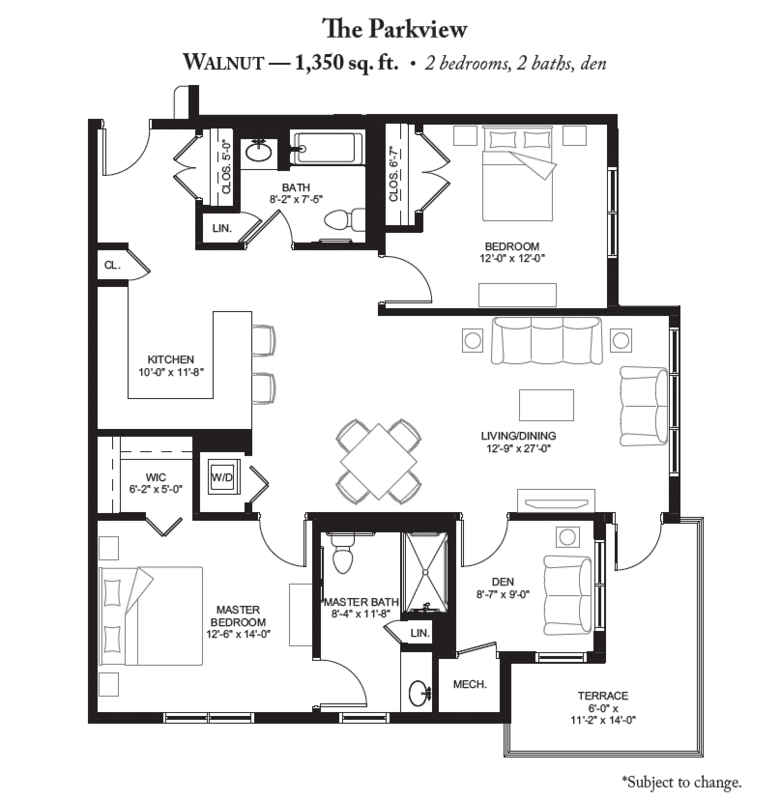 As the only one of its kind corner residence in the beautiful Parkview building, The Walnut features a remarkable 11 windows to let in an abundance of natural light and beautiful wooded views. When you make your deposit and reserve your residence, you’ll be able to choose whether your new home will bask in morning sun, or whether the warm afternoon sun will bathe your home in a soft glow. As you enter The Walnut, two closets in the foyer will be your first glimpse of the generous storage throughout the apartment home. Just a few steps further and you’ll find yourself in the large, modern and inviting kitchen, complete with breakfast bar. The open-concept kitchen looks out over the living and dining areas, allowing freedom for many living room layouts. Off the living room, you’ll find the large 6’x11’x14’ corner terrace, providing generous space for an outdoor dining set, a private sunrise or sunset view, and room for potted flowers or vegetable plants. This outdoor area is perfect for enjoying a nice mug of coffee or cocoa, or for unwinding at the beginning or end of the day. You could even use it for dining al fresco if you choose not to leave your apartment home to go to one of Fountaingate Garden’s dining options. Also off the living room is the den, a cozy space perfect for your library, a loveseat and TV, a computer desk, or as the setting for your favorite hobby. If the living space isn’t enticing enough, the bedrooms will certainly seal the deal! The master fits a king-sized bed and bedroom set, and features a walk-in closet and a private full bathroom. The en suite bath includes a walk-in shower and an oversized vanity, providing copious counter space, plus a linen closet for even more storage! The guest bedroom offers room for a queen-sized bedroom set and features a sizable closet. Both bedrooms feature two windows each to allow the day’s light to filter through your favorite window dressings. Next to the second bedroom, you’ll find the second full bathroom, which also includes a linen closet. If you’re looking for a beautiful apartment home to couple with the incredible services and amenities you’ll find at Fountaingate Gardens, The Walnut is an excellent option. To reserve one of these homes for yourself, give our friendly, no-pressure sales team a call at (631) 715-2693.